It’s a simple but clever tool to convert your SoundCloud song downloads into actual followers and likes. Sure you’ll still have to do your share of the legwork in promoting your tracks, but it’s a welcome addition to any smart DJ/producer’s audience-building toolbox. If you upload your own original productions to SoundCloud, you know the importance of getting likes and follows on your music. It is the “social proof” that makes things happen for you and hopefully gets you noticed, with all the gigs and opportunities that having well-followed and well-liked tracks brings. Until recently, there was a similar trend on Facebook called “like gating”: in exchange for a “like”, you got to download music via an artist’s Facebook page. A lot of DJs used this to grow their audience by uploading exclusive content and setting up these “like gates”, but as of late last year Facebook banned this practice. But luckily, it’s perfectly possible to do something similar on SoundCloud, which is a great place to host your music anyway, and that’s where Hypeddit comes in: It’s basically “fan gating” (getting a follow/like in return for a download of your track) designed to work with SoundCloud. Hypeddit works as a middleman between you and SoundCloud: You upload your track as you normally would on your SoundCloud account, create a special page branded how you want it to be in Hypeddit (they call it a “fan gate”) where you post a link to your file and add some banner artwork, and then you take the provided link to that page and add it to the “download” button on the track’s SoundCloud settings. 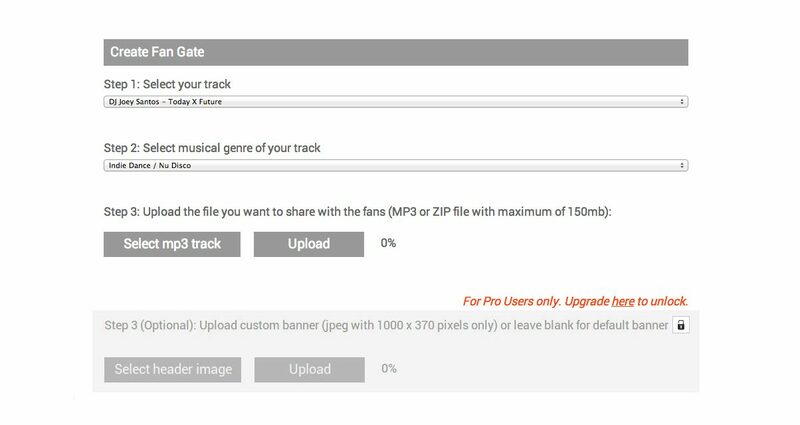 Whenever someone clicks “Download” on your track in SoundCloud, they’re automatically taken to your Fan gate which has a “Download & Like/Follow” button. 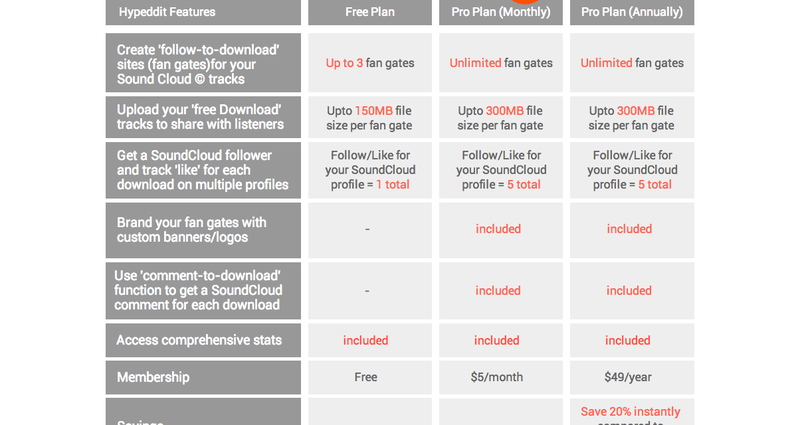 Creating your first fan gate is simple enough: Specify which track it is on your SoundCloud page, upload the MP3 file somewhere, add the fan gate link to your track’s “Buy link” in SoundCloud, and you’re done. I signed up for an account by logging into SoundCloud and connecting my account to Hypeddit. I opted for a Free account for this trial (you’re limited to three “fan gates” in total with the free version, and you can’t customise the pages’ branding), and I was taken to my Dashboard where I proceeded to set up my first fan gate. 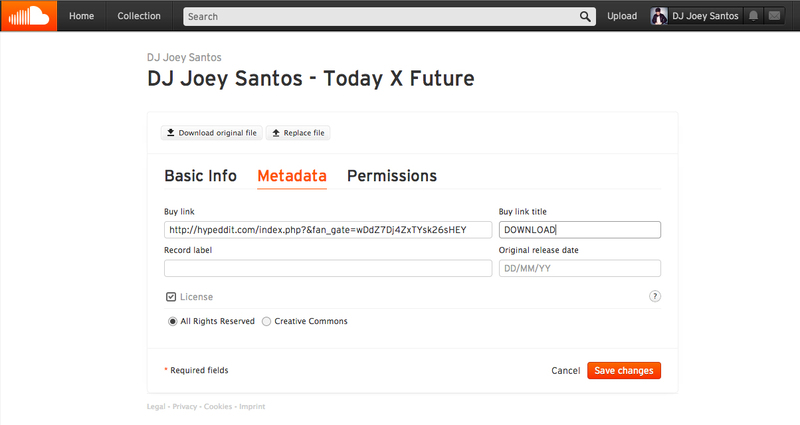 Copy over the fan gate link from Hypeddit to your track’s “Buy link” over at SoundCloud, and change the title to “Downloads”. Whenever someone clicks on this, they’re brought to your Fan Gate. The second part of the process is adding your fan gate page’s URL to your track in SoundCloud. I went to my song called Today x Future, added the fan gate page URL to the “Buy link” field, and changed “Buy link title” to “Download”. Now whenever someone clicks on that download link in my track on SoundCloud, they’re automatically sent to the fan gate page where they have to log in to their SoundCloud account in order to download the track. This is an important part of the process: If you don’t paste over the fan gate URL to the “Buy link” field and change the title, folk won’t get redirected to the fan gate and will just download the file as normal. Here’s what a Fan Gate looks like if you’re a free user. A paid account on Hypeddit lets you upload your own custom banner artwork. 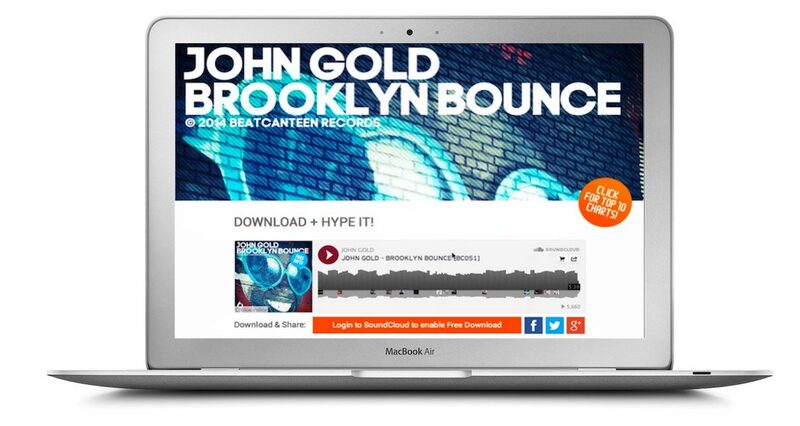 From now on when sharing your track, you can share the Hypeddit link leaving fewer hoops for your would-be fans to jump through to get a download of your music; those who stumble across it on SoundCloud can use the “Download” link to end up in the same place. Either way, you now have a simple link to a special web page where people can hear your track and download it if they wish, and in doing so they’ll automatically like it on SoundCloud. Now it’s just up to you to promote that link like crazy as you would anyway; what Hypeddit is doing is allowing you to maximise your return from everyone who follows the link and decides they want a download of your song. Genuine fans, in other words. 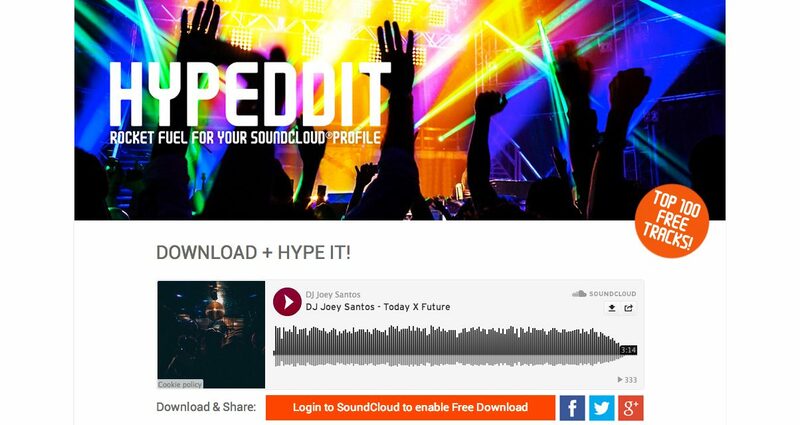 Hypeddit has a new feature called “Hype Your Music”, which lets you send out your track to a handful of SoundCloud PR accounts who’ll repost your track for a fee if they approve it. It’s a very new addition and the jury’s out on its effectiveness at this point; we’ll test it and keep you informed, but in theory it could offer benefits… as long as your track is worthy in the first place, of course. With all the less-than-savoury ways you can get more followers, likes, and plays by spending for them, the unavoidable question for Hypeddit is this: Is it fair and ethical to use? The answer is yes. Unlike some other online services that charge for fake followers and spambot plays / likes, Hypeddit doesn’t promise you hundreds of new likes or thousands of plays: In fact, you may very well not have any new activity on your track at all if you don’t do your share of promoting it as you should. This is an important distinction of Hypeddit, as it doesn’t “cheat” the system to make you appear more popular than you really are; what it does do is create a separate page that equates a download with a follow and a like. It means you have to work as you always did to get people to listen to your music, but those who download it automatically follow/like your content. Seems fair enough to us. In all honesty, I’d put a fan gate on as many tracks on my account as possible. If a person likes my music well enough to download it for free, I believe that a follow or a like is a natural course of action. While you most probably won’t be raking in millions of new followers and likes, every little bit counts in social media, and this is a tool that has the potential to net you more activity on your SoundCloud page – and more importantly, more genuine activity. In the long run, that’s what will get you noticed and get success for your productions.